Happy Thursday! I purposely picked photo locations this weekend with lots of green since I'm tired of looking at all the dead trees around me. One note about this jacket - I made it from Vogue pattern 7810 about nine years ago, but I've always thought the shoulders came out too big and have yet to fix it! Also, super busy again this week, so I hope you have a great weekend! You MADE this jacket???? It is GORGEOUS! 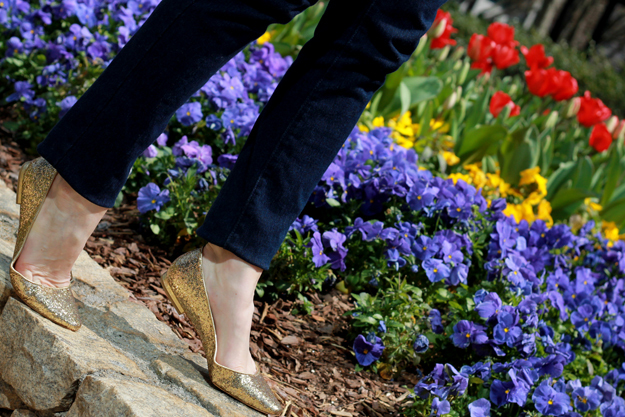 And I love that you paired it with the gold flats! The blazer is super cute , and I couldn't and still don't see anything wrong with the shoulders. I have a really similar blazer that is a pink and black tweed. It even has the same type of belt in the front. I've had it or years and was thinking of getting rid of it in my next closet purge, but you've inspired me to wear it again. Your hair looks extra pretty here! 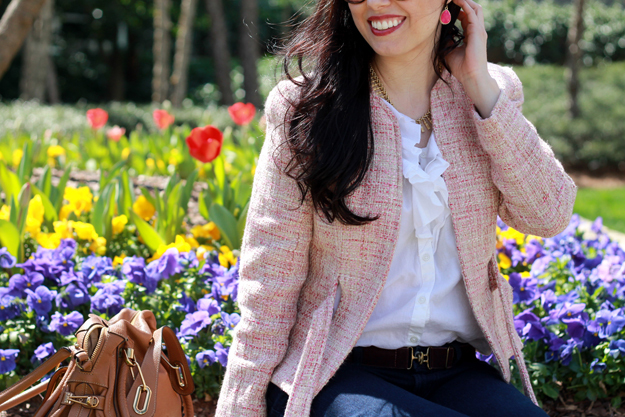 That's such a pretty blazer for spring. You blazer is so awesome!! And it's incredible that you made it! You are so talented. I can't believe you made that jacket! SO cool! I love it! You MADE that jacket?! Get out! I'm jealous--I can barely sew buttons back on to my clothes, yet alone make something. It's gorgeous--and "voluminous" shoulders are coming back in to fashion at the moment too, so it still looks 'current'--no easy feat for most 8 year old jackets. I love it, Mary Ann! Beautiful photo spot...and you look lovely in pink!